Flicker Alley and a group of amazing sites for fans of silent and classic film are proud to bring you this giveaway for?Behind the Door? (1919) on Dual-Format Edition Blu-ray/DVD. Legendary producer Thomas H. Ince and director Irvin V. Willat made this? ?the most outspoken of all the vengeance films according to film historian Kevin Brownlow?during the period of World War I-inspired American patriotism. Hobart Bosworth stars as Oscar Krug, a working-class American, who is persecuted for his German ancestry after war is declared. Driven by patriotism, Krug enlists and goes to sea. However, tragedy strikes when his wife (Jane Novak) sneaks aboard his ship and is captured following a German U-boat attack. Krug?s single-minded quest for vengeance against the sadistic German submarine commander (played with villainous fervor by Wallace Beery) leads to the film?s shocking and brutal climax. This newly restored edition represents the most complete version of the film available since 1919,thanks to the collaboration of the San Francisco Silent Film Festival, the Library of Congress, and Gosfilmofond of Russia. Sourced from the only two known remaining prints and referencing a copy of Willat?s original continuity script, this edition recreates the original color tinting scheme and features a new score composed and performed by Stephen Horne. Flicker Alley is honored to present Behind the Dooron Blu-ray and DVD for the first time ever. Restoring Irvin Willat?s Behind the Door:An inside look at the restoration process with the restoration team. Kevin Brownlow, Remembering Irvin Willat: Directed by Patrick Stanbury, an in-depth interview with renowned historian and honorary Academy Award? winner Kevin Brownlow on the career of director Irvin Willat. Official Release Date: April 4, 2017?Pre-order now at the special sale price of $29.95 for a limited time! 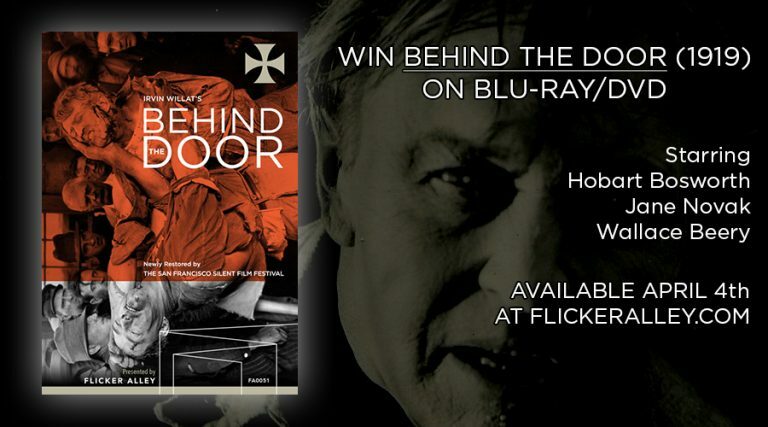 One lucky winner will receive a copy of Behind the Door (1919) on Dual-Format Edition Blu-ray/DVD from Flicker Alley! Giveaway is open to residents of U.S./Canada and ends on April 12, 2017. Please watch the trailer above and let me know what your?favorite part was in the comments below!